I watch A LOT of food/recipe videos, and I really like ones like Tip Hero and Tasty. Unfortunately, many of the recipes are not WFPB or contain dairy, animal products, eggs, or oil. Today, a friend (shout out to Jimmy!) posted this video and though it was ridiculously fattening and not vegan, I thought, "This CAN be done!" So, I grabbed a Fuji apple out of the fridge, and this is what I made. OMG! My husband and I gobbled down the "rings" in seconds flat. They were crispy and apple-y and cinnamon-y, and WOW! This is the batter PER each apple you use. So, double or triple or whatever depending on how many you decide to make. I used one Fuji apple (with the peel on! ), and that was a nice little treat for me and my husband to share after dinner. Slice apple(s) 1/2 inch thick and cut out the center with a large circular cookie/biscuit cutter, leaving about a 1/2-inch ring. Dry all of the apple "rings" well with paper towel. Dip the apple rings in the batter and coat well. Tap off on the edge of the bowl and place on parchment-lined baking sheet. Do this for all apple rings. Bake for 15-20 minutes until crispy on all sides. I did not even have to flip mine over to achieve this. Finally, in a small bowl, combine some maple syrup with cinnamon. 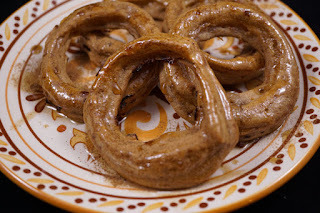 Brush onto warm, crispy apple rings and serve! Do you peel the apple or leave the peel on? Leave the peel on! I will edit the recipe. Thank you!